Anziani e non Solo, in cooperation with CRID / Interdepartmental Research Center on Vulnerabilities and Discrimination, will host a 6-day training event on 16 – 21 October 2017, in Modena, Italy. 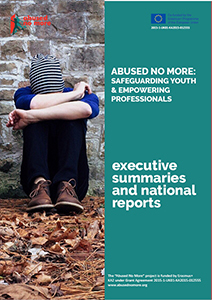 The event entitled “Abused No More: Safeguarding Youth and Empowering Professionals” will strengthen the skills and competences of youth workers and young volunteers who are working with marginalised youth especially those who are facing exclusion and multiple discrimination. A specific focus will be dedicated to the problems faced by asylum seekers. The training will also be an opportunity to visit organizations (public entities and NGOs) active in the field of antidiscrimination in Emilia Romagna Region and to learn more about their programmes and initiatives. • Create knowledge and raise awareness of the specific needs and realities of marginalised young people who face (or are at risk of) multiple discrimination. • Develop knowledge and awareness about user-led/youth-led models of empowerment, engagement and participation. • Provide participants and their organisations with useful methods and tools that can be directly applied to their work with their target groups. • Exchange knowledge and best practice among professionals from different countries who are working with diverse groups across Europe. The training is organized within a framework of the Erasmus+ KA2 funded project entitled “Abused No More: Safeguarding Youth and Empowering Professionals”. This is a 3-year project that aims to bridge the knowledge, educational and training gap in Europe in the area of legal literacy of young people and professionals in the area of exclusion and discrimination of marginalised youth especially those who tend to be marginalised due gender-based abuse, their cultural differences (e.g. migrant, refugee) and ethnicity. 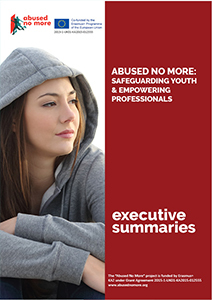 The findings of the first phase of the project were published in a comparative report entitled “My Voice – My Rights: Young, Marginalised and Empowered by the law” (http://www.abusednomore.org/e-book-download/). Participants will be offered a bursaries to assist in covering travel and accommodation costs for the entire duration of the project. The amount depends on the country of origin, as per the table below. Participants are responsible to arrange for their travel and accommodation in Modena.